Q. How I can give my jewellery back ? Ans. At a Company Store on showing proof of purchase/ bill. Q. Will they give cheque or cash ? Ans. A Cheque will be provided immediately in the store. Q. If there is weight loss in my jewellery during wearing, what will be buy back weight? Ans. At the time of buy back the Jewellery will be cleaned to remove any foreign substances and weighed again which will be taken back on 22 Karat Price. Q. Why will the gold & diamond in the Jewellery be reassessed at the time of Buy Back ? Ans. There is some wear & tear in Jewellery when it is worn on a regular basis. At the time of buy back the Jewellery will be cleaned to remove any foreign substances & checked for any loss of diamonds and weighed precisely to check for any loss of gold weight. Q. What is the meaning of life long guarantee chain? Q. If I buy jewellery for the gift purpose and do not give the bill to the concerned person what will be the buyback policy for him/her? Ans. You can take the gift card option.The Unique ID on the certificate of the jewellery will provide the details. Q. Do you accept part payment for booking of jewellery? Ans. It is not possible because gold rate changes regularly. Q. Are the price shown on the website inclusive of taxes ? Ans. Yes Prices are inclusive of all applicable taxes. Q. How do you determine your Gold Rate? Ans. Our gold rate dynamically refreshes every 20 minutes as per current Indian market Price. Q. What is the Refund Policy if we cancel the order before the delivery is done? Ans. Refund & buy back policy are same. Q. Are their any hidden/additional costs? Ans. Hallmark is a third party certification of the purity of gold . In other words, it tells you the percentage of pure gold present in your gold jewellery. In India , this is done by Assaying and Hallmarking Centres , authorized by BIS, confirming to the necessary standards. The necessary standards are IS 1417 : 1999 for jewelers and IS 1418: 1999 for Hall Marking centres . This was introduced by Govt of India to safe guard the interest of consumers.Gold articles are evaluated and tested at an official Assaying and Hallmarking Centre and then certified that the metal used confirms to the National and International Standard of fineness and purity. License is granted to the jewellers by BIS under Product Certification Scheme. The BIS certified jewellers can get their jewellery hallmarked from any of the BIS recognized Assaying and Hallmarking Centre. It will provide clear indication of a jewellers capability, strong evidence of commitment to quality and assurance of consistency in purity and quality of gold (or silver) jewellery. Hallmark consists of five components i.e. 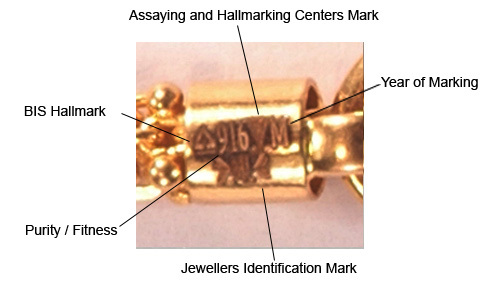 BIS Mark, the fineness number (corresponding to given caratage), Assaying and Hallmarking Centre's mark, jeweller's mark and year of marking denoted by a code letter and decided by BIS (e.g. code letter 'A' was approved by BIS for year 2000, 'B' being used for the year 2001 and 'C' for 2002). The marking is done either using punches or laser marking machine. Q. Is the chain length inclusive of lock(hook)? Ans.Chain length is without lock (lock is approx 1 Inch). Q. If I order today and the amount will be deposit later what rate will be applicable? Ans.Your amount is confirmed for 24 hours(1 Day) Please deposit the amount in company's account. Q.How does we insure that our order is perfect? Ans.It is advisable to visit the company’s store, check the weight, feel the finish and own it. Q.What gold rate will be applicable when I return back my jewellery? Ans.Current market gold rate will be applicable as these gold rates dynamically refreshes every 20 minutes as per current indian market price.